The Black Sheep has made a name for itself since it opened its doors in 2005 by inviting famous artists to their stage such as Imagine Dragons, Tigers Jaw and Macklemore. However, this venue doesn’t just cater to the big names. They also give new and local bands a chance to perform in front of crowds at more than reasonable ticket prices for the public. This is no place for a couple looking for a Michael Buble concert environment. You can find that at the Motif Jazz Café, located 12 minutes away. 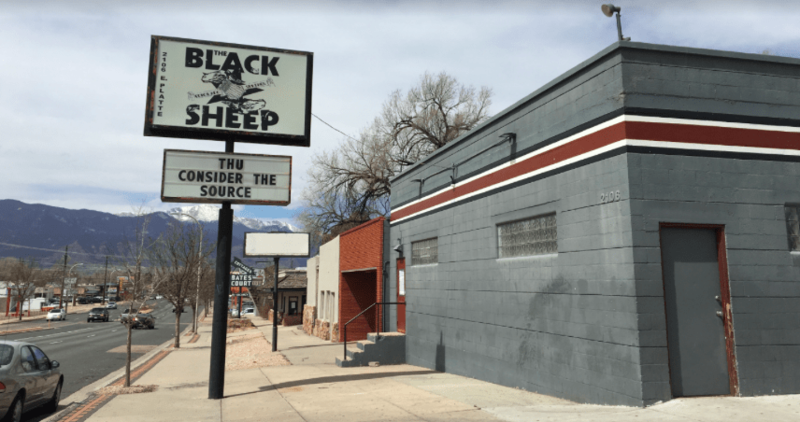 Attracting bands and artists from all different genres of music, the Black Sheep has been known as one of the few remaining authentic DIY music venues in Colorado Springs. Located at 2106 E. Platte Ave, the Black Sheep is not only a convenient drive for students, but it also offers a range of ticket prices that can start as low as $5 and sometimes as high as $35 depending on the show. The venues parking is safe and easy, and if you aren’t one of the first 30 people to take advantage of The Black Sheep’s free parking spots right next to the entrance, you can also park on the side street of East Platte Avenue. Toward the back of the venue is a relatively small bar that manly offers pilsner beer as well as a small selection of cocktails. Watching the band perform from the bar is a nice option rather than having to carry your drinks into the crowd. The venue ranges from all different types of genres, but always stays intimate and loud. This is due to the size of the venue which holds approximately 450 people, as well as the height of the stage from the ground. A stage that is lower to the ground makes for a more intimate show. A fair warning about the Black Sheep is that shows can get crowded, sweaty and noisy. Bands that play with intensity might provoke some younger folks, typically at the front of the venue, to form mosh pits and get rowdy themselves. This could make or break a concert depending on the person, but if you know who you are seeing before purchasing a ticket, then this should come as no surprise. Every great musician has started their musical career in smaller venues that welcome everyone onto their stages; in most cases these musicians have no choice in the matter anyways. Larger venues need more money to operate and function, they don’t always have the opportunity to put on an act that hasn’t had much publicity yet. Allowing musicians to grow and practice first in smaller venue results in them being able to still make a career out of music. If you need any more information on the Black Sheep, you can go to their Facebook page or Website.